LONDON, April 9, 2019 /PRNewswire/ -- Electronic commerce is growing by leaps and bounds, making it clear that the future of shopping is digital. So much so that the penetration rate of electronic commerce in the United Kingdom in 2016 was 87 percent. As a result, the United Kingdom is a key e-commerce market, accounting in 2016 for 33 percent of all e-commerce sales made in Europe, according to the JPMorgan report entitled "The changing dynamics of payments in Europe". The online shopper is demanding, and does not want to give up anything, the shopping experience from home must be flexible, intuitive and personalised. For that reason, Citibox, a company based in Madrid, has developed a solution for the main problem of electronic commerce: the delivery of the purchase at the customer's home. The company installs free smart mailboxes in the common areas of residential buildings, which substantially speed up delivery by the parcel company. The business model consists of charging the parcel companies for the savings they achieve off the increased productivity while using the automatic delivery system, while usage for the recipients of the package is completely free of charge. Since its beginnings in 2015, the company founded by David Bernabeu, has among its shareholders the most select investors of the Spanish technological landscape, such as Bernardo Hernandez -who acts as the company's Chairman-, Banco Sabadell, Bonsai VC or Big Sur Ventures and has raised €12 million (£10 million) in previous financing rounds. "We know our product solves a problem that is growing at the same pace as e-commerce, with a market size of two trillion Euros and a growth last year of 26 percent. Our goal is to offer a solution to millions of people within a global market," explained David Bernabéu, Citibox´s CEO. After two years of operation in Madrid, the company has installed a total of 5,000 smart mailboxes that serve 25,000 people, making more than 200,000 deliveries of packages and after evaluating various models has decided to focus on residential buildings. Next year Citibox plans to install 310,000 smart mailboxes in more than 40,000 residential buildings in Madrid, representing a total investment of €26 million (£22 million), offering a free package pick-up service at home to almost two million people, reaching 6 out of 10 inhabitants of Madrid. As the operator of these smart mailboxes, Citibox expects revenues of €188 million in 2022 (£162 million), with an Ebitda of €73 million (£62 million), a margin of around 40 percent. 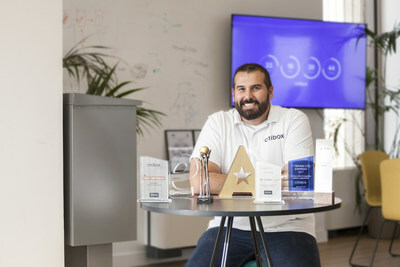 Once consolidated in Spain, Citibox aims to take the international leap and install 1.7 million smart mailboxes in the top ten european cities.